How to undo move out? From the main menu, Click on right pane icon and choose lease menu. Choose the lease that you want to perform undo move-out. 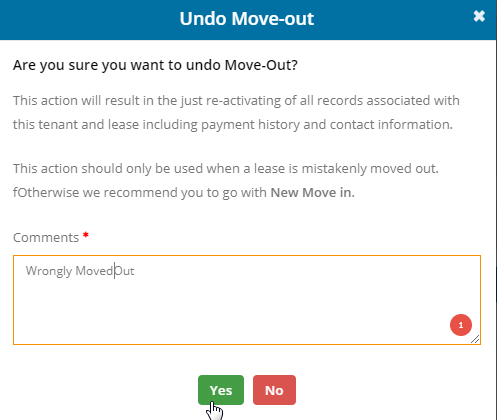 On the top right of the lease page you could see the button named as Undo Move-Out. Click on that to proceed. Enter the remarks and click on Yes. Now the lease turned out as Active lease. Note: You cannot perform undo the move out operation if some other tenant occupies the same unit currently.